I've written before about how I make a little extra money by taking surveys online. I also like to sell items on eBay! and at yardsales. And I earn free gift cards simply by checking my email. It takes some time to do these things and they don't bring in huge amounts of money, but they are easy to do and every little bit helps. Another way to make some extra money is by doing side work, consultations, or freelancing. Hubby is an accountant and along with his regular job, he also does bookkeeping for a few businesses and tax prep work for many of our friends and family and his coworkers. He charges fair enough prices to give them a good deal, but to also allow us some additional income. This year, hubby's looking for some new clients. He decided that handing out some business cards would be a great way to advertise his services. Of course we didn't want to spend an arm and a leg on this. And luckily I am the Queen of Finding Good Deals. We ended up going with VistaPrint.com. They have several Free Deals of the Week and one of them happens to be 250 FREE business cards. All we had to pay was a small shipping charge of $5.45. Not bad at all. They took less than 2 weeks to be printed and delivered to us and they look great! They had about 40 different designs to choose from and this is the one hubby went with. 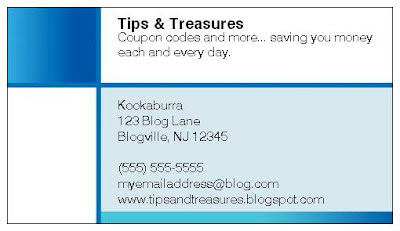 Note: All of hubby's info has been changed out with Tips & Treasures fictitious info. Hint: These cards also work great as mommy/daddy calling cards. At the playground and your child really hits it off with another child, introduce yourself to their parent and hand out your card. That way, you can be in contact for future playdates. In case you're interested, VistaPrint.com has a ton of other free samples. Some of them include rubber stamps, checks, address labels, t-shirts, and note pads. And you can customize each one of those to your own specifications. Just click this link for the Free Deals of the Week and you will be taken directly to that page. Awesome suggestion. My friend always gets her business cards when they are offering free deals. I think I am going to head over there right now as well. I am selling some of my stuff at a craft fair in Oct. and these would be great to have. I have a Q that I hope you can answer. What is the best way to organize one's blogs? Ive tried news feeders but I aways forget to check it. I then bookmark, and forget where I put what? Any thoughts?